Best seasons to visit Puglia are late spring / beginning of Summer and Automn, until end of October. The weather is perfect, not too hot, and the sea is warm enough to swim. Summer time is nice to visit: weather is hot but windy, so still enjoyable. On the other end, beaches and coastal towns get really crowded wit hlocals, prices are high and traffic jams not uncommon. How to get there and to travel around Puglia? Brindisi international airport is your convenient landing point to visit the Southern part of Puglia. Many low cost airlines have direct flights to Brindisi. The best way to go around is to hire a car: Puglia is a perfect region for fly and drive vacation, so that you can enjoy it in full freedom. Public buses could be an option as well, even though less convenient. If you have more time, you could easily dedicate one additional week to visit incredible Matera, the area around Bari with the amazing Castel del Monte and the fascinating Tremiti islands. Would you like some help on your Italian trip planning? Then click here and I’ll gladly support you! Get out of the airport, get your rented car and head to your first destination: Ostuni. Ostuni, the “white city”, is one of Puglia most remarkable jewels. The Aragonese walls, all around, protect the art jewels that shine inside. The most remarkable is the cathedral that rises in the highest part of Ostuni. Built in the 15th century in “docile stone”, it’s a perfect example XV century flourishing Gothic. Its magnificent rosette is among the largest in the world. The majestic church of S. Giacomo in Compostela, the convent of the Benedictines, with the annexed church of S. Pietro, and the churches of S. Francesco and S. Vito Martire shouldn’t be missed. But it’s mostly the narrow winding streets, dazzling in their white walls, that are worth a visit, as well as the fascinating views of the sea and the surrounding countryside. best way to enjoy them is at sunset, wile sipping a chilled glass of local wine. The Relais Sant’Egidio, just outside the city walls, offers great accomodations in an ancient palace, with great views over Ostuni city center. Alberobello, the capital of the Trulli region, is one of the most famous destinations in Puglia. Although very touristy, it remains a pleasant destination to visit. Better to arrive early in the morning, before escorted tours arrive. Locorotondo and Cisternino are two small jewels, that mass tourism wrongly neglect. In particular, Locorotondo a delightful white hamlet built on a small hill, was recently named among the most beautiful villages in Italy. It offers beautiful views over the olive trees and wine yards country side all around. Cisternino, is similar to Locorotondo, and a key destination to enjoy a really original dinner. In the evening Cisternino butchers prepare countless outdoor tables where they serve delicious local grilled meat dishes. It can also be interesting to visit Cerrate Abbey (FAI), a Romanesque gem on the provincial road that connects Squinzano to Casalabate (open from 9:30 to 13:00 and from 15:30 to 19:30). Last but not least, the nearby Grotte di Castellana, more than 60 meters deep, offer an amazing scenario made of stalactites, stalagmites and incredible concretions. Otranto, founded by the Greeks, is simply wonderful. From the square of the Aragonese castle branches out the labyrinth of narrow streets and stairs, which make up the ancient village, the oldest and most characteristic part of the city. Each corner offers a little wonder: a church, a view of the sea, a detail to discover. The highlight of the visit is the Cathedral of Santa Maria Annunziata. The cathedral dates back to the eleventh century and is Otranto masterpiece. The most notable element is the incredible mosaic which covers the entire floor of the church. It represents the Tree of Life and is considered by many experts as a true encyclopedia of Christianity (7-12, 15-19.15). The church also preserves in the chapel of the martyrs the remains of the massacre of 800 Christian believers. They lost their lives during the invasion of the Turks in 1480 because of they didn’t accept to convert to Islam. The Relais Valle Dell’Idro is conveniently located 5minutes walking from the city center. It offers beautiful sea views and recently renovated rooms, in a charming setting. Day four is dedicated to the Adriatic sea beaches and coves. Here you find mostly rocky coastline with intermittent sandy beach coves, fjords and cliffs. It could make sense to rent a small motor boat to fully enjoy the sights and to find your own private cove to enjoy on your own. Torre sant’Andrea: spectacular white cliffs and sea stacks, surrounded by turquoise sea. Very small beaches nearby, often overcrowded. Roca Vecchia: just North of Torre Sant’Andrea, Roca Vecchia is actually an archeological site, that you can access for a small ticket. Here the cliff has been used for ages as a stone quarry, with impressive results. Easy access to the sea for a swim. Grotta della poesia (Cave of Poetry) is an impressive 100 foot wide sinkhole at the edge of the sea. It is said it once inspired pets, hence the name. You can dive from its high cliffs into the clear waters and get out of the sinkhole from an underground tunnel (if you dare to do so!). Small boats can be rented nearby. We start day five by visiting in the morning other great beaches close to Otranto. Porto Badisco is a deep fjord, that local fisherman have been using for centuries a natural harbor. You can swim in the crystal clear water and have a good fish lunch at the restaurant on the small beach at the end of the fjord. Santa Cesarea terme coast is mostly rocky, with a number of lovely secluded coves. It also hides the beautiful and impressive Grotta Zinzulusa. You can visit it by foot (entry ticket), but I rather suggest to rent a boat or to join a guided tour, so that you can enjoy all the coast. In the afternoon, you can proceed to Gallipoli, check in, have a shower and get ready for the visit. The main attraction of Gallipoli, the “beautiful city”, is the historic center, built on an island and surrounded by massive walls. The old town, full of old palaces and baroque churches, was built by the Greeks as a kind of labyrinth where all the streets intersect, between the houses with white walls and dark blue cornices. The Sant’Agata Cathedral, one of the highest expression of Puglia Baroque architecture, is absolutely worth seeing. Remarkable are also the “Greek fountain” – dating from the 16th century – located at the beginning of the masonry bridge connecting the new village with the ancient village. A must-see, the tower walls offer the possibility to stop at the tables placed above the old towers for a coffee or an aperitif. Do not miss lunch at the fish restaurant “La Puritate” – it is advisable to book. To get more info on Gallipoli, have a look at my post: “Gallipoli, the “beautiful town” of Salento. The Maison D’Enrì, located 3 km from Gallipoli, offers charming accommodation in a park with a pool and all what you need to relax. From Gallipoli to Punta Prosciutto you will find very long beaches with fine white sand and clear water. You could easily pretend you are on the Caribbean sea rather than in Italy! This area is called “the Maldives of Salento”, and I can witness that this is not an exaggeration! Beaches are beautiful and long, some still unspoiled. It’s easier to find a place to lay on the sand here than on the Adriatic coast. Last day of your week in Puglia. On your way to Brindisi airoport, stop to visit Lecce and its amazing Barocco churches and palaces. You can leave your car in an underground, video protected parking. Lecce is a fascinating city, a shrine of works of art from the Roman, Medieval and Renaissance periods. That said, it is mainly a baroque city, which explodes here in a very specific declination, so peculiar that it is called “Barocco of Lecce”. 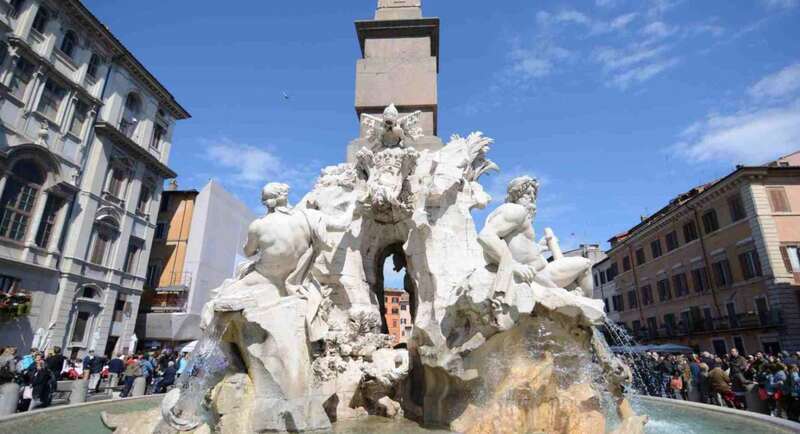 The main highlights to visit are the Roman amphitheater, the castle of Charles V, the cathedral and its square, and the Basilica of Santa Croce. But it’s all the historical center, with refined palaces and interesting craft shops manufacturing and selling papier maché and Lecce stone objects, which deserves to be discovered. From Lecce, a quick drive will lead you to the airport and back home. Ready to visit Puglia? Don’t hesitate to contact me for dedicated tips and suggestions, and to help you organizing a memorable tour. Grazie, a lovely read… Italy has so many surprises. We just returned from our first 3 week visit and still left way too much to see… a return visit may be in store well before we expected. Love reading your posts ?? Many thanks Robin. I agree, I have been living in Italy for close to 50 years, and I keep discovering new marvels! Hi Dale, yes, you can use public transportation means in Puglia. To optimize your day trips logistics it would be advisable to stay in main cities, such as Bari or Lecce, rather than in smaller towns like Ostuni. If you wish to see all the destinations I mentioned in my post you will actually need to select at least two hubs. Let me know if you need any advice to design and to finalize your Puglia trip plan. Thank you so much. I love visiting Italy, and this area is one I have spent little time in. I appreciate your advice.